The Argus Missile is a ground penetrating sensor device that is dropped from an aircraft. The streamlined missile deploys 4 paddles to slow and stabilize on its descent. 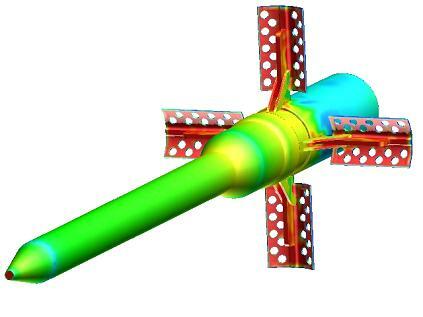 A computational analysis of this action is challenging due to the tight gaps between the folded paddles and missile body, the deployment action, and the motion of the sliding locking ring. The total number of cells is this simulation is 36,485,449 – consisting of 29,031013 cells for the body grid, 1,761,381 cells for each paddle, and 408,912 cells for the sliding ring. The clearance between the ring and body is 0.2 inches. The motion used the General Rotation and Translation motion type for the moving geometries in the Cobalt motion file. All four paddles extend in unison. The hole-cut shown on a cutplane down the Z=0 plane shows the missile grid in blue, the paddle grid in green, and the sliding ring grid in red. The solid geometry is shown transparent. The smooth hole-cut allows for good cell-size match-up between the paddle grids and the body grid. One can see the highly turbulent flow develop aft of the paddles as they deploy and continue on downstream. The flow around the paddles near their anchor points contributes to the unsteadiness seen on the body aft of the paddle anchor points.